Today we made it to Cheyenne, Wyoming. It’s 9 p.m. and the dog, now satisfied that I will not try to leave her for the rest of the night, is asleep on the floor. The teenager is texting about boyish things, and I’m about ready to drop dead after 10 hours of driving. A vigorous exhaustion that not even a giant but weak margarita from the local hacienda grille has been able to extinguish. 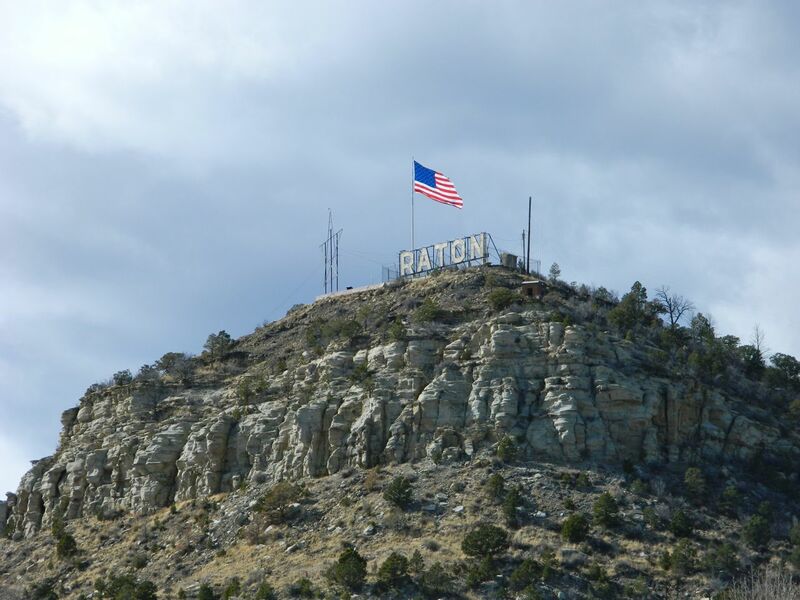 As promised, here is at least one interesting thing from today’s travels: Raton (“little rat”) New Mexico. This was my first visit to Little Rat, once an important stop on the Santa Fe Trail — a busy railroad, mining and ranching center. Before the city was established, Raton Pass had long been used by Spanish and Native Americans to cut through the Rocky Mountains. The picture above is Raton Peak, on the north end of town. 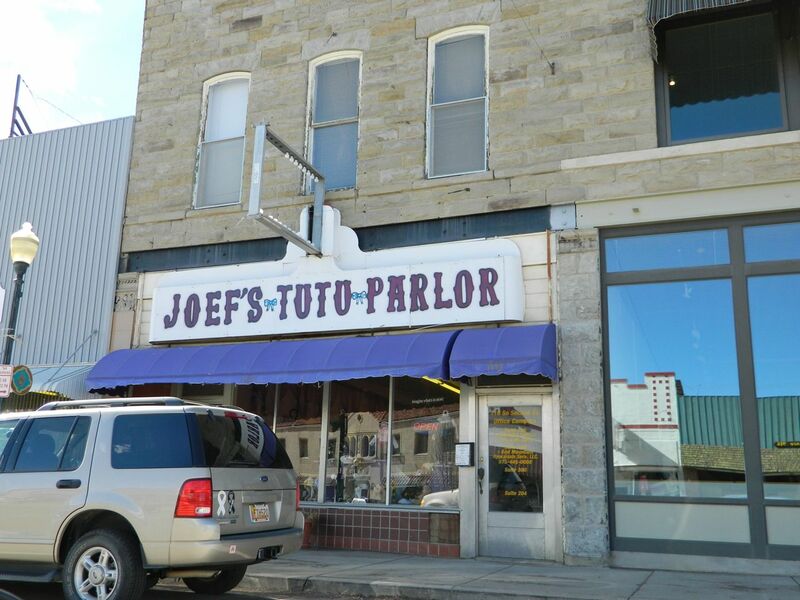 I was hoping in the worst way that Joef’s (rhymes with loafs) was a hip tattoo parlor or at least a bar. But no. It was this. 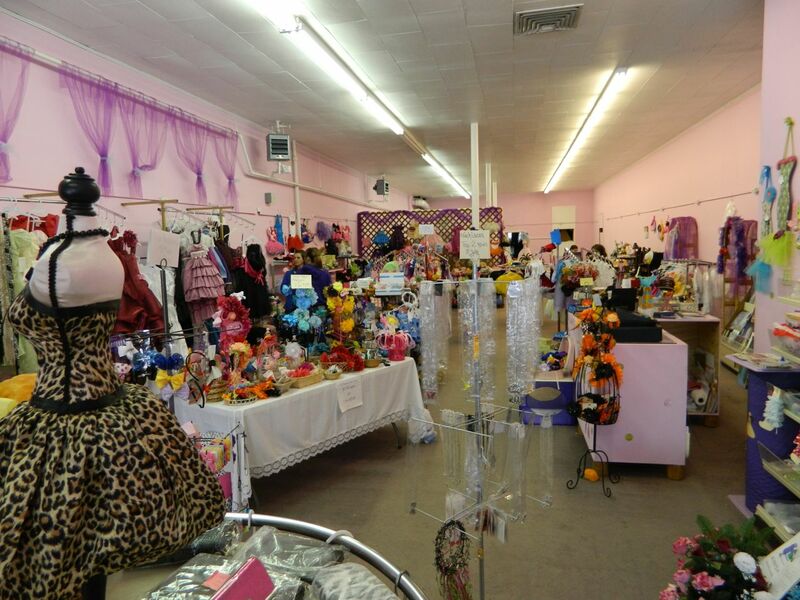 A place where little-girl party dreams go to reinvent themselves. 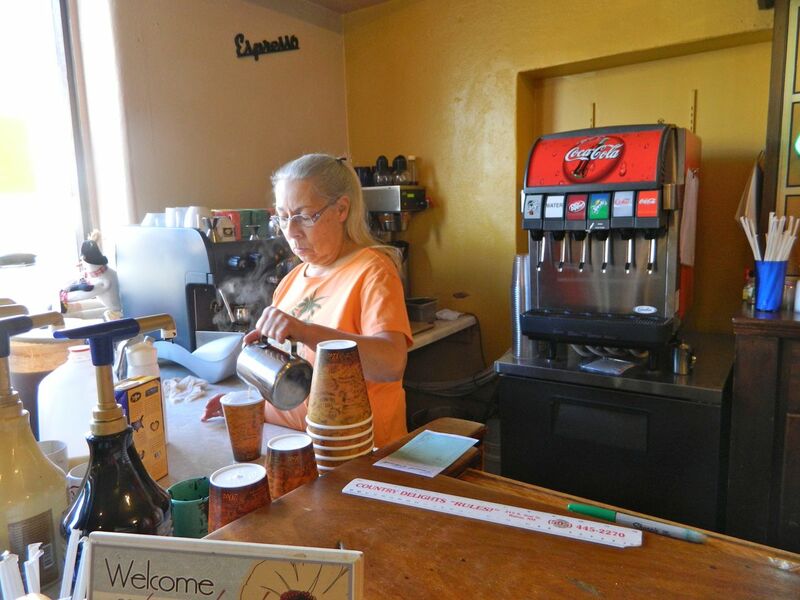 We accomplished one of our two primary road trip objectives — finding good coffee — in Downtown Raton. We were greeted by this barista, whose name I didn’t catch. Contrary to the cheery Hawaiian print t-shirt and buoyant demeanor, she seemed unhappy and not exactly enchanted. But in her defense, I think I somehow gave her the impression that I was mentally challenged and/or deranged. I base this conclusion on the number of times she repeated in loud, carefully enunciated syllables, “WHEN YOU ADD CHO-CO-LATE TO COF-FEEE IT MAKES A MOH-KUH… MO-KUH”. This was in response to my inquiry about the Special Flavor of the Day (choc with cinnamon, vanilla, and chili… doesn’t that sound good?) and my misreading of choc for chai. MOH – KUH. 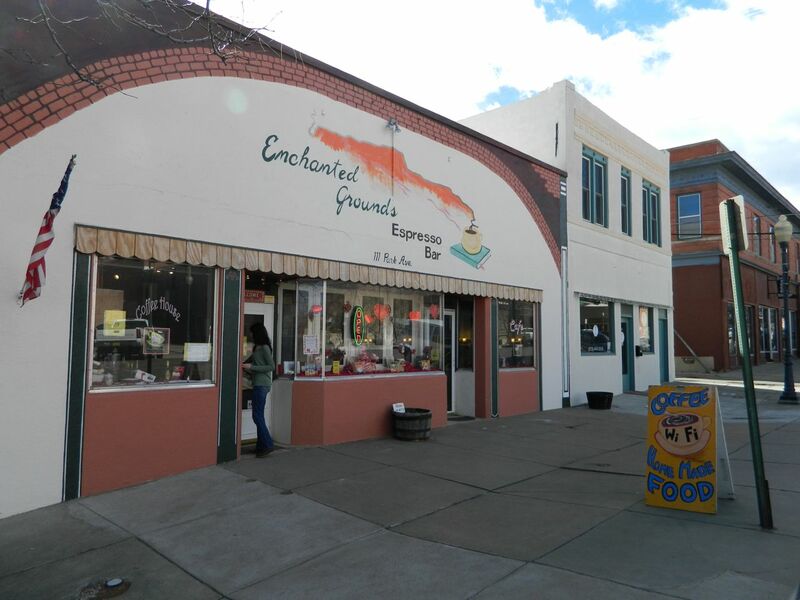 Sharing a space with Enchanted Grounds was a painter of Pet Rocks. Get it? The painter was friendly and animated and happy to talk about her work. Interesting fact: people will not pay her for traditional paintings of their pets (which she also offers). 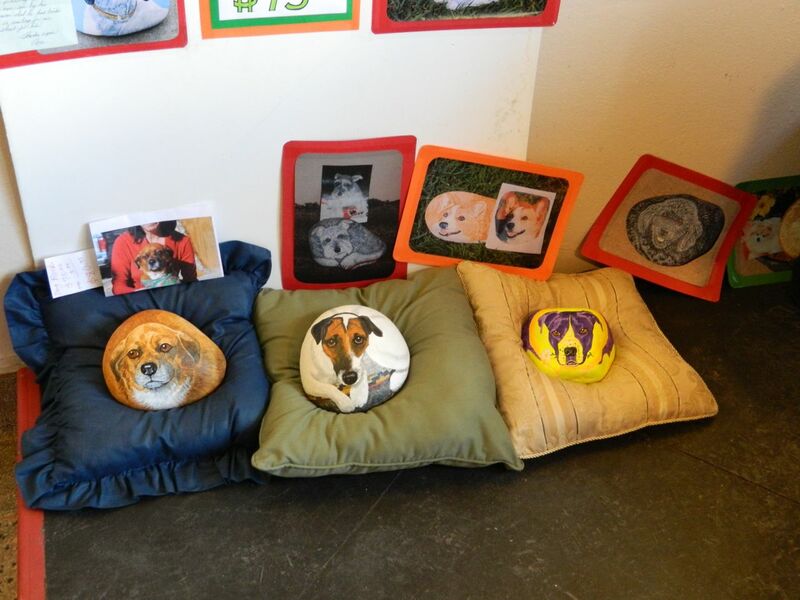 But they will pay for paintings of their pets on rocks ($75 ea plus shipping). She didn’t know why. I’m guessing it’s because in this economy, people want to invest in multi-tasking artwork: a painting, a garden element, something you can hold in your lap or use to weight papers or stop a door. More bang for your buck. Down by the railroad tracks was this gorgeously ambiguous building. And finally, I could collect old neon signs. 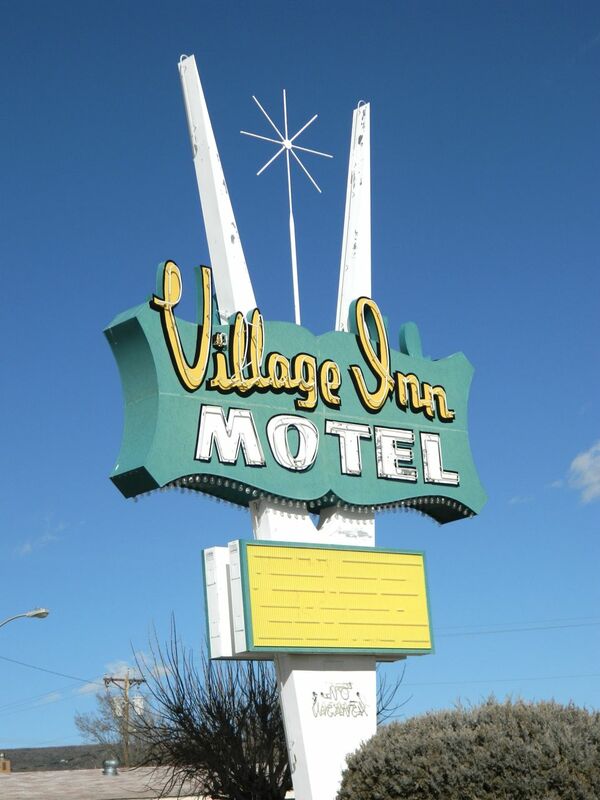 This one advertised a motel that looked neither opened nor closed — a black truck parked in front of a room, and a bar-b-que grill by the office, but no people. Like someone is now using it as a residence. Which is as creepy as an empty airport. That’s it for tonite. We’ll drive 2 hours tomorrow and surprise Jessie at her new home in the morning. I hope she’ll be happy. I bought a new rear tire for my motorcycle at the Kawasaki dealer in Raton after puncturing it in Kansas and growing weary of repeatedly plugging it on the roadside only to have it eat the plug. That was a few years ago. At least it will be a short drive, and then your destination. Love the pet rock – very clever! It was a short and terrifying drive, Guap… I was so hoping you were wrong about the weather! Not so much the cold, but the blowing snow was a thing of nightmares. But past tense, so you made it! Hope you have a blast while you’re there. I did, thanks! I have some catching up to do — no internet connection for most of the time. Hey, Laura! You’re in my old stomping grounds! Lionel and I lived in Cimarron, just West of Raton, when we were first married. Did you know Nikki Zabikki now lives in Raton? You should try finding her studio – the old Ford dealership, I think – if you haven’t done so already. Hi Kei, thanks so much for stopping by and commenting! I had no idea you and Lionel lived in Cimarron. I can’t believe I’m a NM native and this was the first time I’d been through the area (that I can recall, anyway). I knew Nikki moved to Raton but didn’t know she was ensconced in the old Ford dealership. Or where that is. She told me about the building and it sounded large and historic. I’ll have to look for it next time…. You need to write a travel guide for people with a sense of humor. I need a MOK UH with Chili right now. Rufina and the Garcia sisters are doing fine although I want to go check them soon. 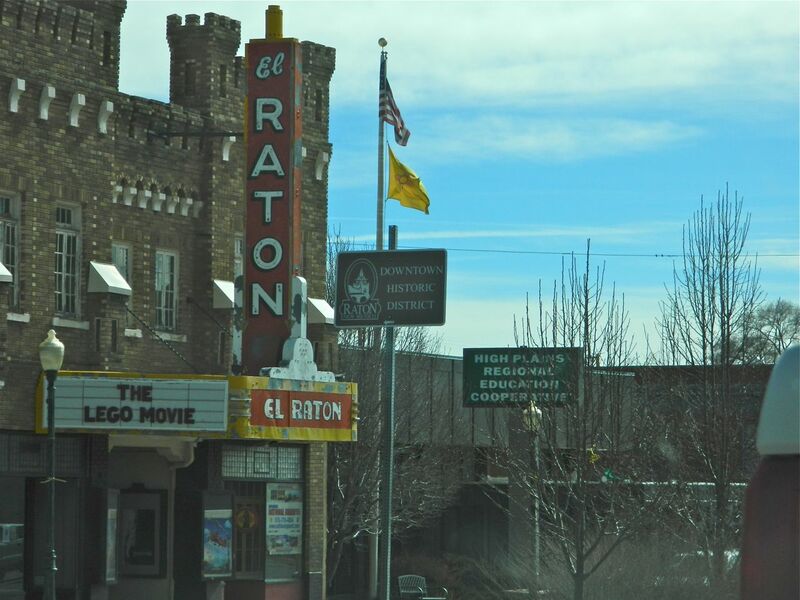 We have stopped in Raton so many times over the years, driving from Denver to Albq. to see my family. A few years ago we decided to stay overnight at the historic El Portal hotel. Did you know that Dorothy Parker was married there in the thirties? It broke our hearts when we saw it had burned to the ground in November 2012. Raton is a really interesting place. Have a great trip Laura, love following your travels! Thanks Theresa, and I had no idea about Dorothy Parker! That is so interesting. And what a shame that the El Portal burned down… now I wish we’d done more NM travel before now. I guess since I’ve been the only driver and trip organizer, it was hard to make happen. Thanks as always for your thoughtful comments! I have to pass this along too . . . I don’t know where in Nebraska you’re going, but just past Lexington off Highway 30 is the birthplace of Robert Henri, the artist who wrote one of my favorite books, The Art Spirit. He was a painter and leader of the Ashcan school, a cousin of Mary Cassat, do you know him? There is a museum there http://roberthenrimuseum.org/index.php/visit/directions. It’s closed this time of year, but the website says you can call for a tour. It’s right off the hwy, we found it by accident seeing a sign on a road trip. (We were driving from Denver to a wedding in Omaha). I had his book in my suitcase, no idea that the continental sophisticated Robert Henri was from Cozad, NE. Yes, I know who Robert Henri is and read Art Spirit at some point, maybe in Chicago. 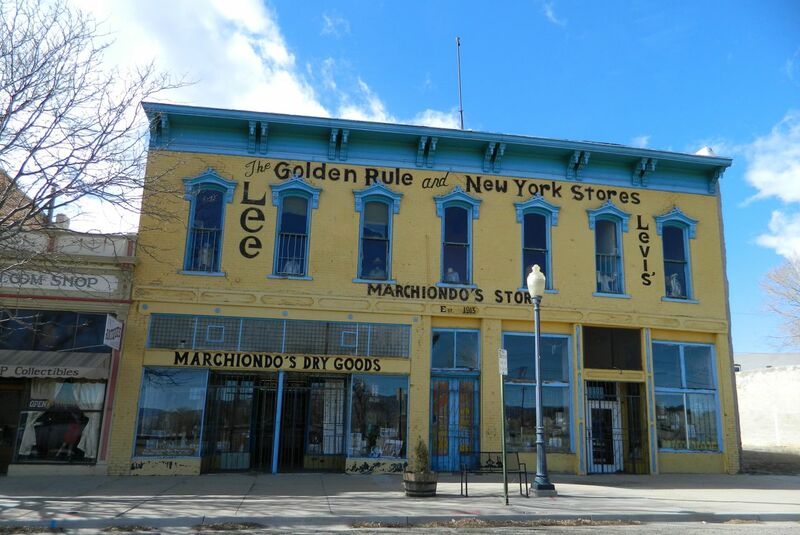 And we actually visited Lexington many years ago because Jessie lived there before Scottsbluff. We tried to go to the museum but it was closed (this was pre-internet days…). Maybe we’ll try again, I’d forgotten about it. Sure sounds like you get a lot of adventures in as well! 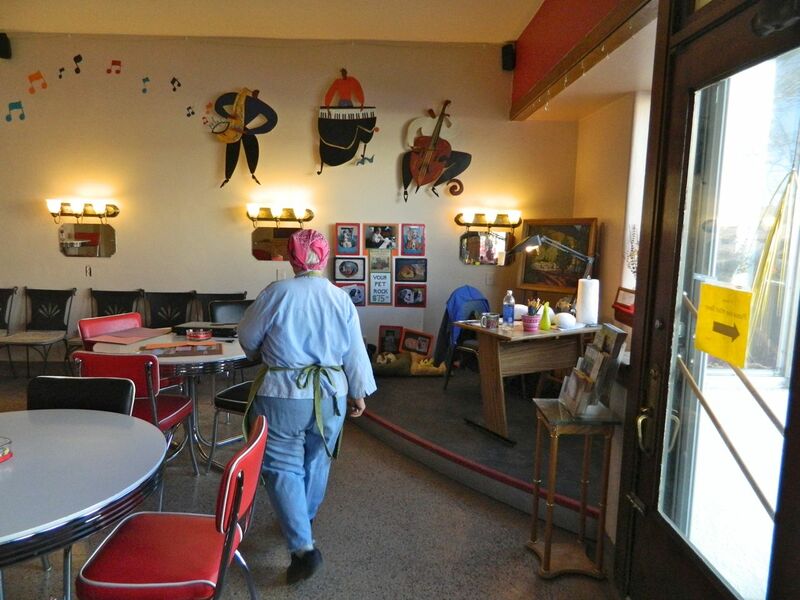 I keep being drawn to that photo of the tutu parlor – like driving by a huge pileup on the highway, or passing by a train derailment! Yes, it was one of those things. Once I realized it wasn’t for tattoos, I figured it wouldn’t be great but couldn’t help but look 😉 Thanks for stopping by, Maggi! My dad lives in Varnville, SC which looks A LOT like Raton (with the exception of the racially segregated stores lining each side of the street). At least, I’m hoping that’s not a commonality the two towns share. Hope you’re having a great trip. Are you gonna be anywhere close to Castle Rock on your way back? Girl, you should consider travel writing. I feel like I’ve been to Raton now. Great post and pics. MOH-KUH! Or my favorite: MOH-KUH VOD-KUH! Wow, coming from you that’s such a compliment, thanks MSP. Wouldn’t that be fun? Just travel around to relatively unimportant places and write about stuff you’d never find in a travel guide? Hmmm…. Yes, it would be a dream to do nothing but travel and write about the people you meet and the places you see. How wonderful to have all those stories to tell.